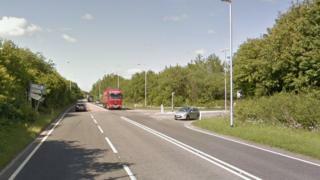 A man died when the car he was driving collided with a lorry in Somerset. The crash happened at the junction of the A361 and A362 near Frome at about 10:45 GMT. The man, whose age has not been released, died at the scene, Avon and Somerset Police said. Road closures remain in place around the scene and people are being asked to find alternative routes, the force added.